A belaying pin is composed of a round handle and cylindrical shaft. The shaft is inserted into a hole in various strategically located wooden pinrails (lining the inside of the bulwarks, surrounding the base of masts, or free-standing, called fife rails) up to the base of the handle. A line is then led under and behind the base of the pin then round the top in a Figure-8 pattern till at least four turns are complete. Excess line is coiled and stored neatly by taking a bight from the upper part of the final strand, looping it over and round beneath the coil, then twisting it once or more before slipping the twisted end over the top of the belaying pin to secure the coil in place. As improvised weapons and means of discipline on both military and civilian ships. 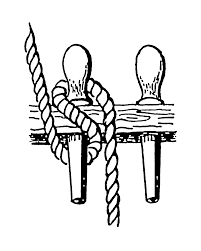 As toggles in belaying pin splices, an emergency method of rejoining ship’s rigging where a belaying pin, marlinspike, or other short stout bar is used as a toggle to hold two rope eyes together. As a means of adding heft to a heaving line when a monkey’s fist is not tied in its end.